ROME - Until now, tourism -- cultural as well as seaside and culinary -- has been hailed as Italy's magic beam, transporting the country beyond the losses from runaway factories and ever more present robots which replace workers. 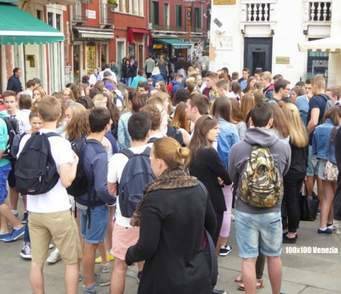 Nevertheless a small but serious reaction against the vast influx of tourists is becoming ever more evident, with protests over pollution and overcrowding. In Rome alone every day over 800 gigantic buses bring tourists in and out of town, in what is called in the popular press "a constant invasion," without a seasonal break. 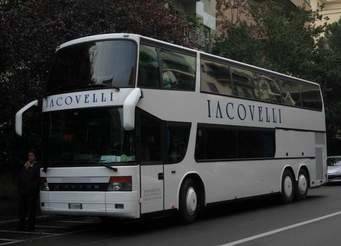 An example that enraged the city fathers was the killing, by one of these outsized buses on Saturday, Oct. 6, of the deputy prefect of Rome, the distinguished Giorgio De Franceschi, 54. The accident took place on Via Cavour only a short distance from the Colosseum. With his wife, who survived, De Franceschi was crossing legally in a downpour on a strip of white stripes, which theoretically oblige a driver to stop. Weeping in desperation, the driver said that he had pressed his foot on the brake, but the bus simply did not stop. Just last July a woman of 22 carrying a load of boxes was run down and killed by another tour bus on Corso Vittorio Emanuele, a busy thoroughfare near Piazza Navona. By way of official reaction, Rome Mayor Virginia Raggi of the Movimento 5 Stelle (M5S) announced a plan to take effect Jan. 1, which divides Rome into three sectors. Zone 1, which covers the downtown historical center located within existing ZTL barriers, is to be off limits to the big tour buses (called, by the way, torpedoni, or big torpedoes) save for those carrying children on school outings. To make this more serious the tariffs for Zones 2 and 3 are being hoisted up by 1,700%. The tour buses' annual permits are to be replaced by tickets that can cost up to $300 for each entry; the price is to vary depending upon how much the the vehicle pollutes (!) Needless to say, the higher fees will be paid in the end by the tourists. This plan, which was to take effect last summer, was postponed by six months after pressure from the tourist industry. The lame excuse for this delay, according to an official city spokesman, is that: "Tour industry programs are sold the previous year." 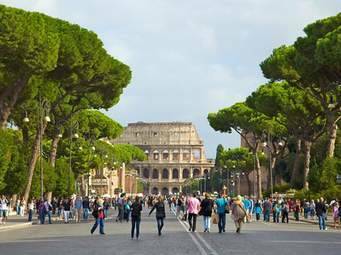 Rome attracts some 40 million tourists annually, and gives work to 150,000, generating over 10% of the city's income. To survive, the big buses tend to drive in lanes where they are not permitted, and as a result in a year some 4,500 drivers were given tickets; another 13,000 tickets were handed out for other misdemeanors. The financial advantages of mass tourism are obvious. In 2016 alone, according to the Ministry for Culture and Tourism, entry fees for museums, archaeological sites and monuments brought in E174,988 , an increase of E20 million over the previous year. All told, Italian tourism contributes 11% of the GDP and employs 12% of the work force. But the problems remain, such as how to bring tourists near the Vatican. During the Jubilee Year of 2000 a system of mini-buses took over from the "torpedoes", which were left parked in the outskirts. 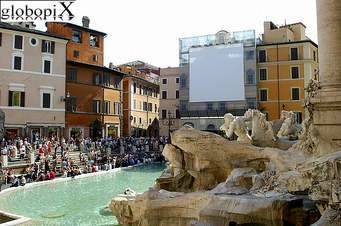 A revival of this is suggested, but fails to consider the gigantic increase in Roman tourism in the past 19 years. Perhaps even more than Rome, Venice is particularly stressed. "For cities like Venice and other delicate sites like the Cinque Terre, I think we have to make tourism year round rather than just seasonal," said Evelina Christillin, president of the national tourism agency ENIT, speaking last summer to Sputnik News. "We have to explain to the tourists -- and here digital networks can be useful -- that tourism must be sustainable." This is simple in museums, where entries can be limited. The Italian infrastructure must be improved, including train lines, she added.